Sepidah has checked with her mother, who says the monkey was all soft and did NOT have hard face, hands, and shoes. 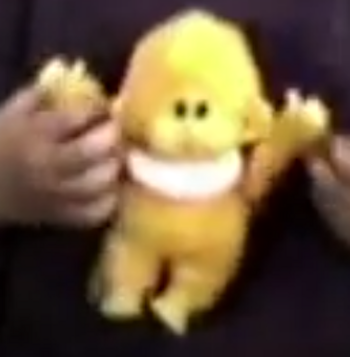 I’m looking for this little yellow monkey in a white bib and shoes, but I don’t know the brand. I think the hands, feet and face are hard plastic or vinyl and the rest is stuffed. This monkey belonged to my fiancé, and it was his favorite stuffed animal, his absolute bestie! “Dumle” went everywhere with him. But he lost it when he was a kid. I would love to see his smile when I give it to him the morning of our wedding on June 28, 2014.